1 Sheet Stickers. Sheet size:20 9cm. Clean then surface ,then sticker on . Material: PVC. the product in the picture maybe larger than actual one. High quality in EU and US quality standard. Cute sticker. 150pcs/lot Hand Made Medal Sealing label Sticker for cake decoration. Quantity: 150pcs, only the sticker,others are decoreation. Material: paper sticker. - And do not worried too much if your parcel is on the normal sending way your parcel is on the normal sending way! 100% new high quality each style is very cute, which Each style includes three size. Scrapbooking Stickers / Labels SALE!! Lots more Hallmark Halloween sheets listed and even more to list! Great for lunch notes for your kids & pleasant reminders for anyone. Item : Christmas Stickers. Material : Self-Adhesive Paper. Shape : Round. 100pcs Handmade Label Sticker baking packaging Sealing stickers 1x1"
And do not worried too much if your parcel is on the normal sending way your parcel is on the normal sending way! Quantity: 100 pcs. Karen Foster Design. Use these thick, flat stickers for cards, invitations, scrapbook pages and so much more. The variety of colors and designs enable you to find just the right accent for any craft project. 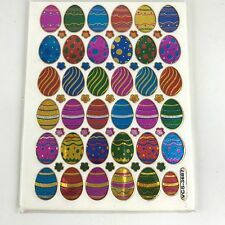 Sandylion EASTER Stickers. YOUR CREATIVE POSSIBILITIES ARE ENDLESS! Stickers add sass, panache, and a dash of glam to your projects. Quantity: 600pcs only the sticker,others are decoreation. Material: paper sticker. And do not worried too much if your parcel is on the normal sending way your parcel is on the normal sending way! If you don't satisfied my item. Recollections BLING SNOWFLAKES Stickers. YOUR CREATIVE POSSIBILITIES ARE ENDLESS! Stickers add sass, panache, and a dash of glam to your projects. Great for Baking cookie decor, Scrapbooking Stickers and so on. 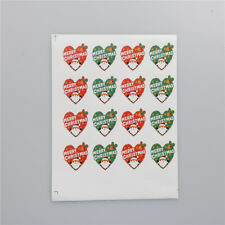 - Lovely Christmas Santa Claus baking seal sticker. - Size of Each Single Round Sticker: 7zcm/1.96in. 10 Sheets Baking Sticker. - Each Sheet has 8 Pieces Stickers. Patterns :paper sticker. content :2 sheet /set. Quantity:You will get 60 Piece of this item at the list price. You will get response within 24 hours. we are very glad to help you. We have the factory. We team have more than 10 years of high quality production and sales experience. You will get response within 24 hours. we are very glad to help you. We have professional service team for your service. We team have more than 10 years of high quality production and sales experience. Quantity:You will get 45 Piece of this item at the list price. 100% New, Top Quality. You will get response within 24 hours. we are very glad to help you. Sandylion Disney CHRISTMAS Scarpbooking Stickers. U Choose. Retired Designs. Christmas, Holly, Mistletoe, Berries, Leaves, Plants. Each sheet approx. (pic shows 2 sheets) (you receive 2 sheets total. ).